To enjoy the benefits of SitzRight, make sure you are sitting towards the back of the product with the handle at the back of your chair. It is important to note that changing your sitting posture can cause temporary discomfort, like going to the gym for the first time. Your muscles, joints and ligaments may need time to adjust and relax into the new posture that your SitzRight provides. If this is the cause of your discomfort, limit usage to 15 minutes and increase usage time over the course of a few days or a week. Go slow and listen to what your body needs. If there is an increase in pain, stop using your SitzRight and consult a medical professional. Made of soft, supportive EVA material, it was designed to help you sit with better posture, alleviating fatigue and discomfort. The contoured design has higher pillars in the back that prop your pelvis up and open the angle between the upper body and legs, reducing strain on the hip joints and encouraging proper posture. 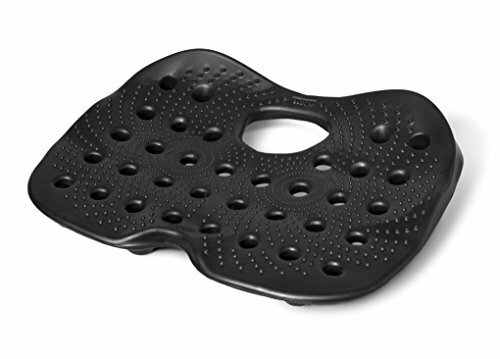 SitzRight also features a unique cutout that provides pressure relief for your tailbone.